Last night they sent me home with a DVD of pictures to take to whatever OB I find in Florida. We searched all morning to see if we could get an appointment anywhere today, and found out that my old OB has closed down her practice, and that no one else was willing to see a new patient on a Friday, even if it was an emergency, including the hospital maternity clinic (they only see diabetic and psych cases on Fridays...). So the waiting goes on. I've been looking at this little picture a lot though. 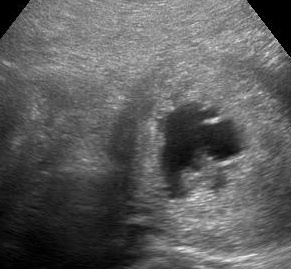 The baby is the little shape at the very bottom (with a mother's imagination I can see a little face). And thank you for all the prayers. They are a great comfort, as our the stories of mothers who've gone through similar experiences and ended with a healthy little one in their arms. I so hope that happens here. You and your little one are in my prayers. With my first daughter I spotted for six weeks and was on bed rest because of it. I don't think I was more than 7 or 8 weeks along at the point when I started having problems. I'm so sorry you are going through this. I will continue to pray that your little one holds on to life. Did you try a crisis pregnancy center? That's a beautiful picture... and even if the worst happens, you'll treasure it. I still have the one ultrasound picture we have of the baby we lost in 2006. Thinking about you and praying for you and your baby! Your little one is beautiful. I hope (s)he makes it! I have never experienced what you are going through, but I can relate because I am a mother myself...my husband and I are new parents - we have a 6mo old baby boy. Prayers are coming! Our Lady of Guadalupe, ora pro nobis! I'm praying for you. My daughter died last year when she was but two days old. Losing a child is the hardest grief. I can totally picture a face! I had one picture of my miscarried son. It is in a frame next to his urn and teddy bear. The teddy was the only thing we ever got for him- I think God tried to prepare us for what was to come. If you have a CD of pictures, I would try and copy it. We did that for each of the ultrasounds from my pregnancy with our son, because we knew what it was like to be left with what felt like nothing. The only comfort I really got out of literature was a poem about how the mother was such a good mommy that God brought the baby home before it was even born- it had learned everything it needed to. The other thing that helped me through the rough patches was "The Climb" by Miley Cyrus (recommended by a friend during the tough pregnancy) and "My Name" by George Canyon. I do recommend that you listen to the Miley Cyrus song if you are so inclined, but you might want to hold off on the George Canyon one. It still makes me cry, although now they are tears of joy. My prayers are with you. You WILL get through this, good or bad. With God, all things are possible. It brings to mind the Bible verse my Godfather dedicated to me- "No eye has seen, no ear has heard, no mind has conceived what God has prepared for those who love him" (1 Corinthians 2:9) May you find hope and peace in the knowledge that God is in control and is carrying you and your unborn baby in his arms. I'm going to Mass this afternoon - I will offer it up for you and your baby! I do not have first-hand experience at what you are going through, but when I imagine what you must be feeling and try to put myself in your shoes, it makes me want to cry. God is with you and your baby, and Our Lady knows what you're going through and feeling! Hang in there, we're praying for you!